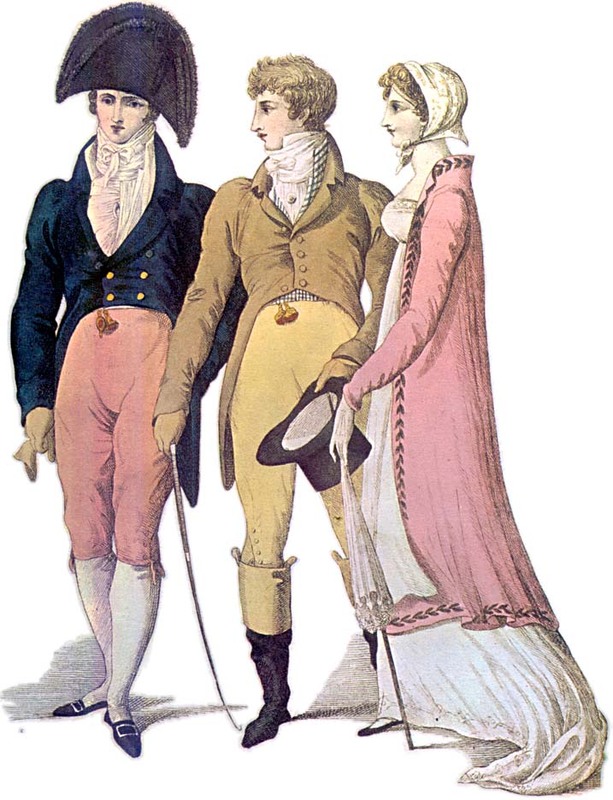 Welcome to Regency gentleman! Several half-hearted posts on this blog were never written due to a hectic summer and the extreme heat wave. I will share some gorgeous pictures from the ball, but first, some of the work that was carried out in order to make it happen. 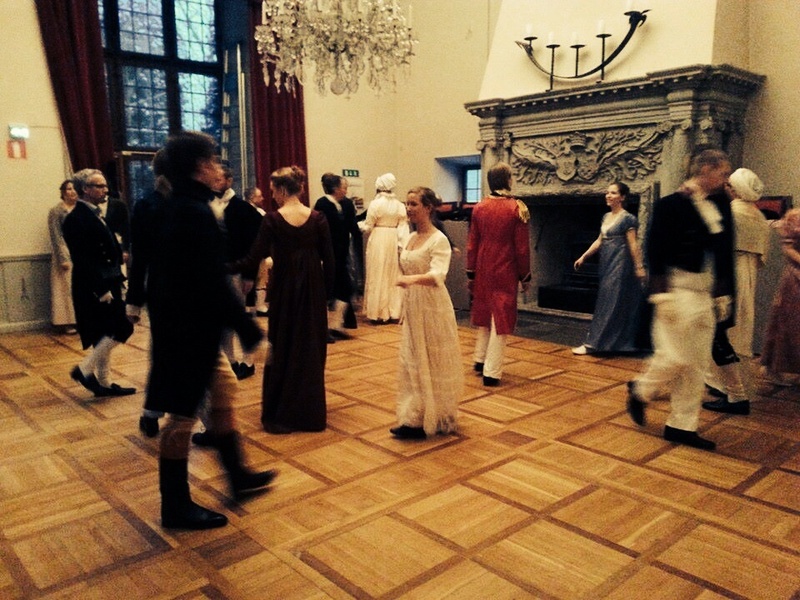 No, I will not bother you with the sweat and drudgery that goes into preparing for a ball in a Baroque palace. Nor the brains and muscles required when moving a harpsichord. Let us take a closer look at some costuming instead. 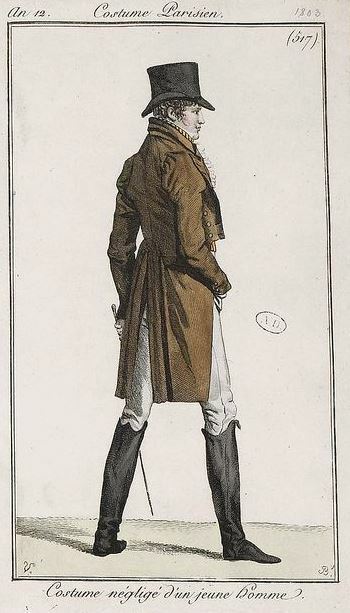 It would have been nice to make something more spectacular, such as a new pair of white satin breeches, but my schedule and level of energy did not allow it. 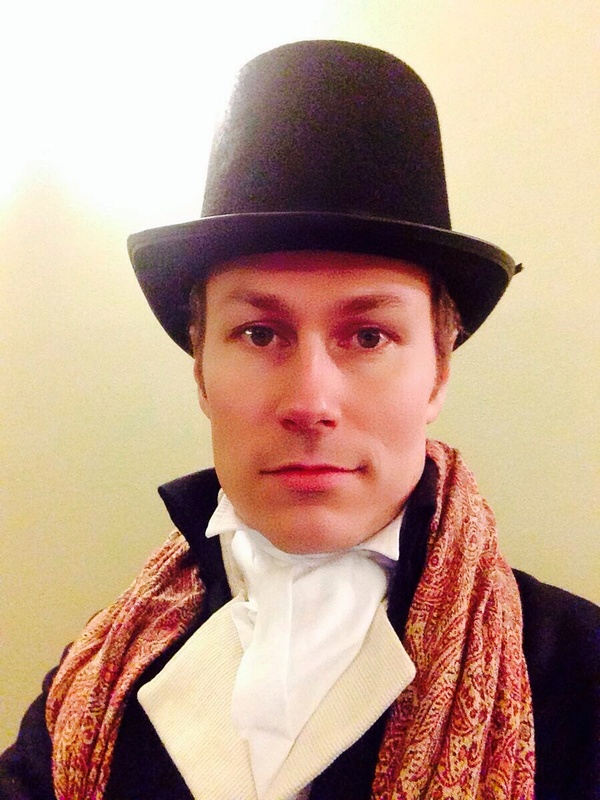 I did however update my look over a couple of evenings prior to the ball by sewing a new cravat. Not only that, but a stock to go with it, with the aid of a shirt ruffle. The new cravat didn’t need the same width as my old ones, so i cut it about two inches wide, and hemmed all edges. You can see a glimpse of it above. Another strip of the cotton batiste was hemmed (took me longer than expected!) and gathered, then secured to some cotton tape, and basted to the front of my shirt. A ruffle! 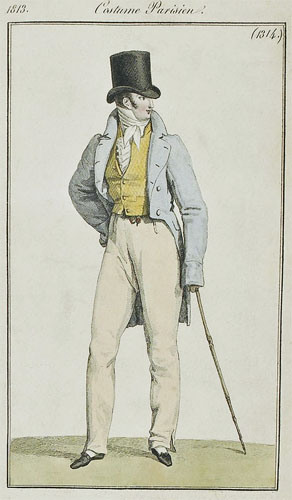 Cravat, stock, and ruffle. Ready for the ball! It was a fun and easy project, and comfortable to wear. Before next wearing I´ll starch everything to achieve a crispier effect, though. Nordiska museet (“The Swedish Victoria & Albert museum”) has a fairly new permanent costume gallery, but space is limited and the costume collection is extensive, so obviously there is much more in storage. 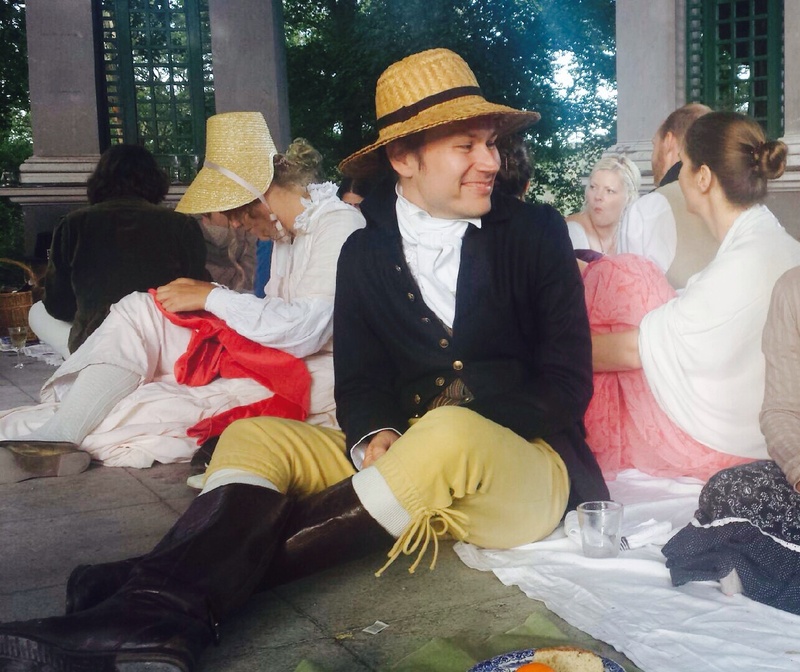 So imagine the thrill when they arranged a handling session last week with garments from the empire era. Needless to say I was there early, but there was already an exited crowd outside the door. It was nice to find several friends among them so we chatted while waiting for our turn. Stock, ca 1820. This pre-tied cravat is in a remarkable condition. The silk taffeta is practically undamaged. 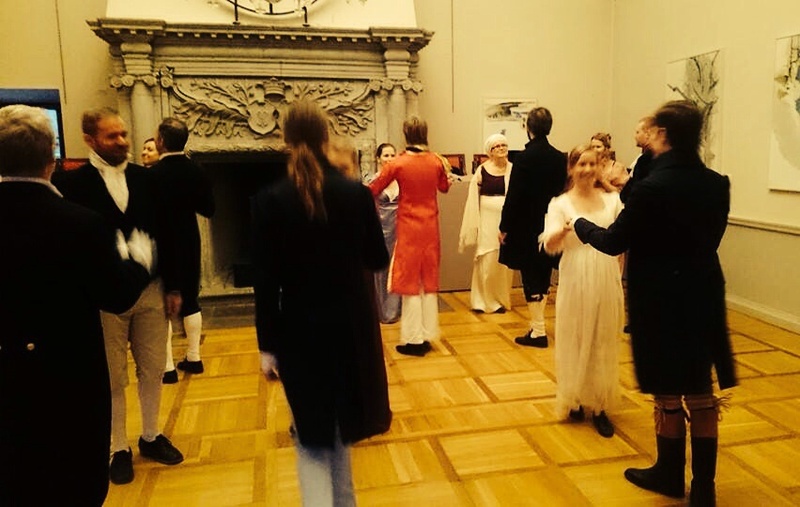 Follow this link to the Swedish museum database for more information. Inside view of the stock. It is thin and weighs almost nothing. It is stiffened with paper. 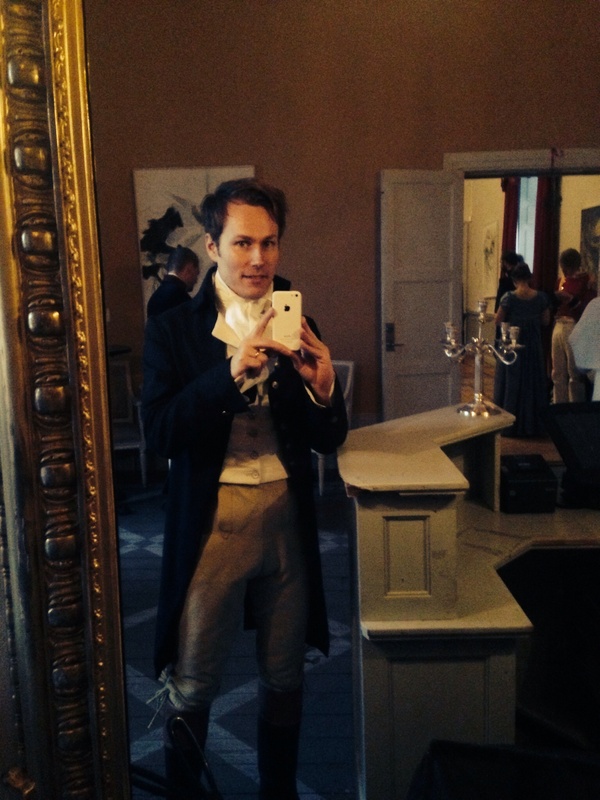 It was great to see this dark blue tailcoat (1820-40). A tailor-made masterpiece like this should be seen on a person or at least a mannequin, laid out on a table did not quite do it justice. Anyway, the coat had many details that are characteristic for the era: m-notch lapels, double-breasted closure, slightly gathered sleeves, bell-shaped cuffs with one button – understated elegance. Again the condition was so good it could have been brand new. Here is the link to the database (where I borrowed the image below, because it was difficult to take any decent photographs). Neat buttonholes and prick-stitch. The lining is a wool and linen blend. Interesting to see the angle where front meets tail. Notice the short v-shaped seam? I suppose it is there to prevent the coat from loosing its shape and to protect from wear and tear. Nice details on collar (above) and pockets (below). I also noticed that the back, made of linen, was unlined. A showy piece of garment, rather than something to keep you warm! One highlight was this shirt, or THE shirt. It was of a very fine quality, both in material and the way it was made, most likely by a skilled (professional?) seamstress/tailor. Every stitch was incredibly fine and most seams were flat-felled. The shirt has a ruffle along both sides of the opening. The shoulder seam and view of the neck. Closure: the shirt was never buttoned, but rather tied with this narrow ribbon. Notice the neat finish of the inside of the collar. Something for the ladies: an evening gown, ca 1815-20. A fresh light blue silk, with cream-coloured trim. In this weird photograph I wanted a look at the inside of the bodice. 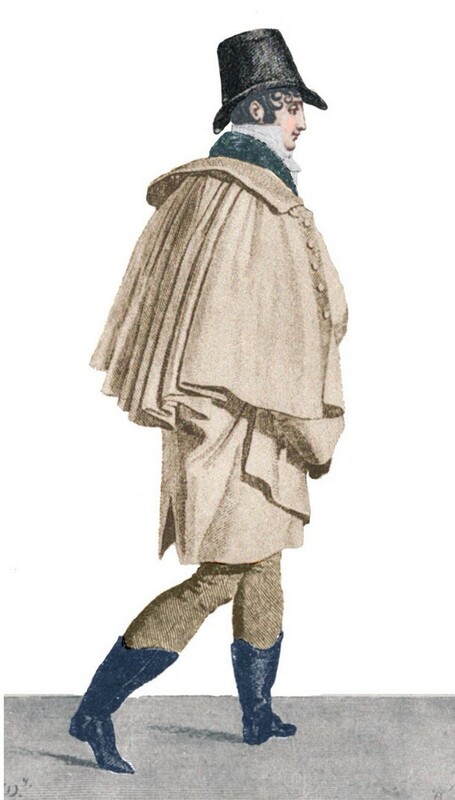 Here the bodice is folded forward over the skirt. There were three or four other gowns, chemises, a couple of frilled caps, and a pair of slippers. Insights and conclusions? Well, as always I have the deepest respect for the amount of work that went into making clothes before industrialisation. You could not just walk in to a shop and buy clothes off the rack. It took some time and consideration to invest in new clothes. People in general had to make do and mend. Books, the internet, reproductions, and film costumes are good sources, but seeing the primary source – the real thing – with your own eyes is invaluable. (As long as you are aware of the limitations in terms of styling, proper underpinnings, posture, hairstyles, social status, etc.) 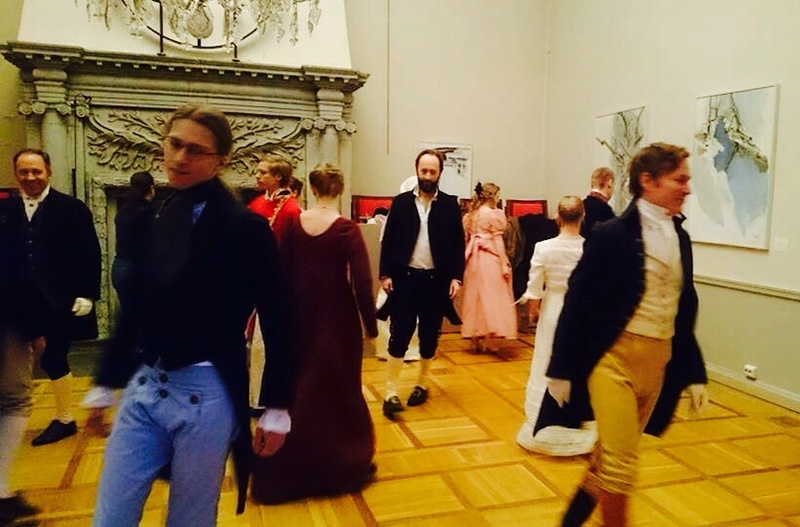 But if you, like me, do not own a costume collection, do visit a museum now and then! The manservant (holding a comb between his teeth) is more fashion-forward, compared to his master. He has stuck a comb in his fashionably coiffed curls, and curling tongs in the pocket on his practical tailcoat. 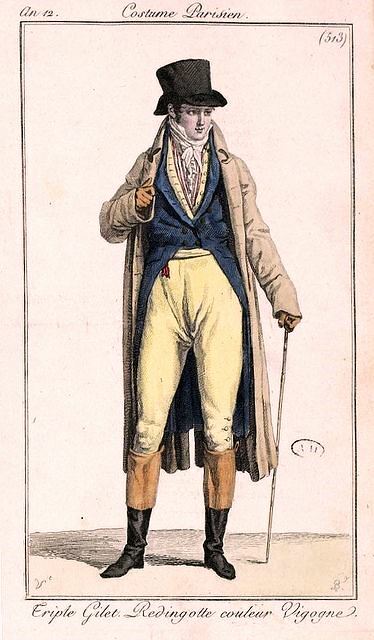 As a personal touch he has chosen to match his otherwise grey outfit and top boots with clear blue stockings. The bedchamber (rented rooms above an inn?) looks very spartan, but there is a elegant card table holding a teacup, candlestick, and nick nacks. Behind it a glimpse of the bed in the Gustavian style with a sheer canopy in blue. The powder must have been everywhere. It is understandable that those who could afford it installed a powder room while others had to make do on a landing in the stairway. And I need not point out that this is before vacuum cleaners. 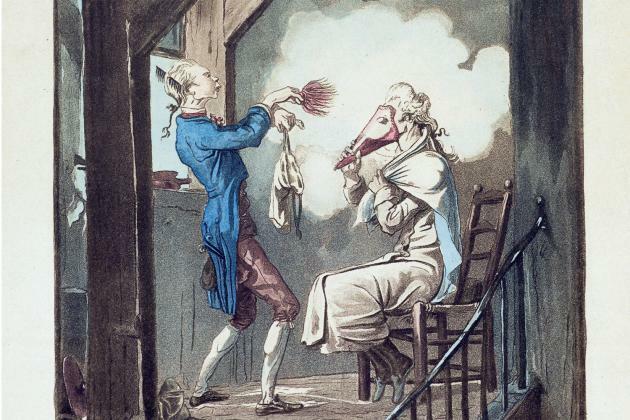 By 1799 wigs were definitely going out of fashion. Only gentlemen of the old school (and where it was part of ones profession such as the clergy, medicine, and the law) would hang on to them into the first decades of the new century. 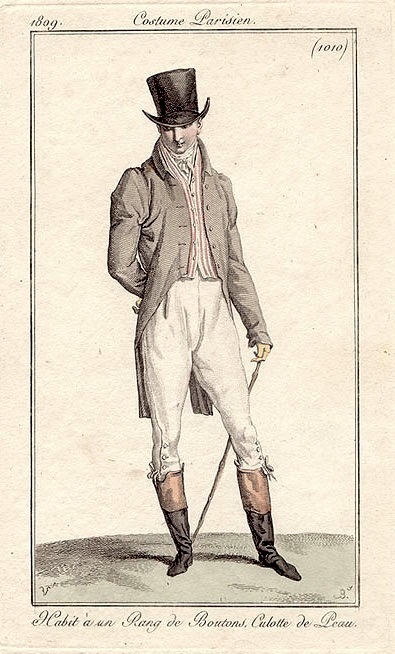 A charicature, ca 1770-1790, where the gentleman and his valet actually transferred on to the landing. A Mother´s Advice. 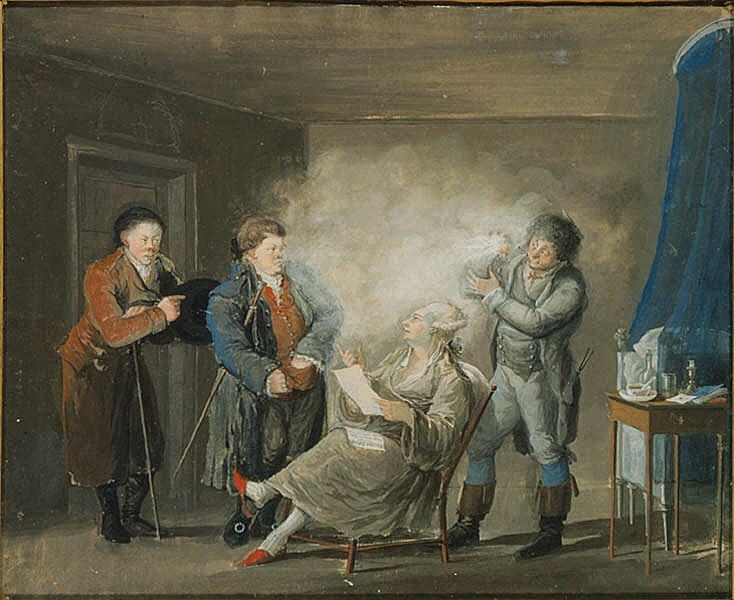 Pehr Hilleström, ca 1800. The State Hermitage Museum. 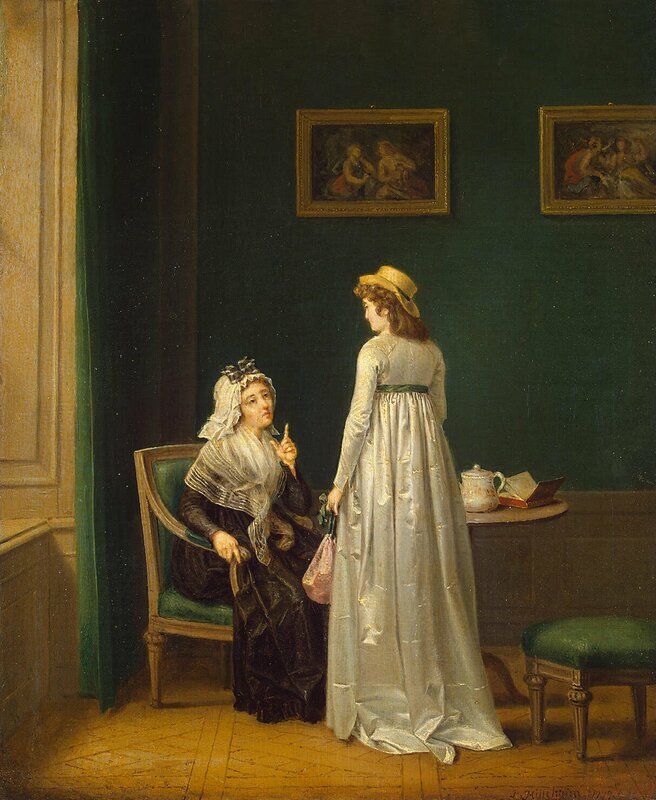 Notice how the daughter is wearing a fashionably high waisted gown while the mother – although we can´t see for sure – is dressed in more conservative dark silks. 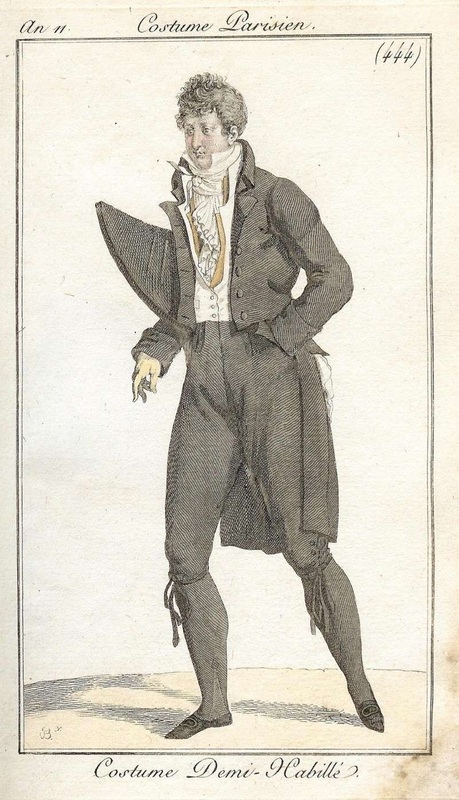 A point of interest: to me it looks like gentlemen in formal dress, as depicted in fashion plates 1800-1810-ish, still used powder on their curls. Or what do you think? 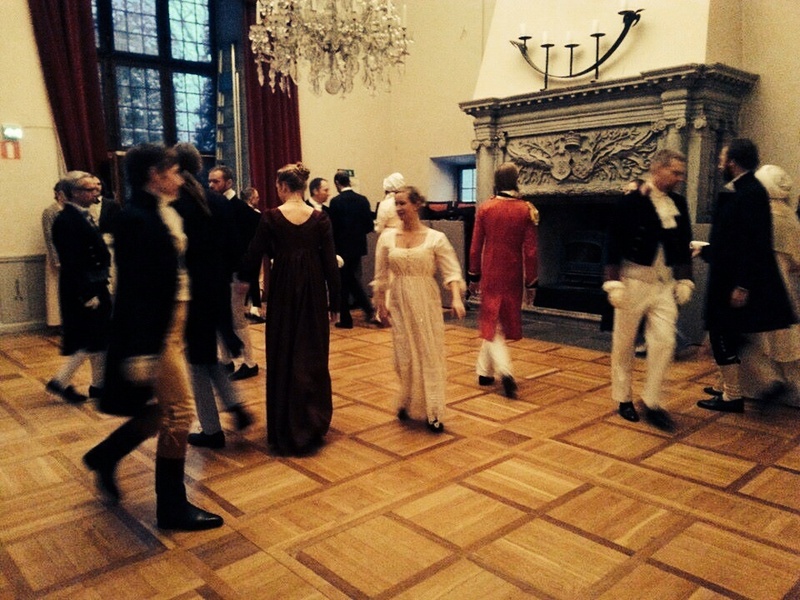 On a Sunday afternoon in January members of The Regency Society (Empirsällskapet) met up at Tyresö Castle for lunch and dancing. 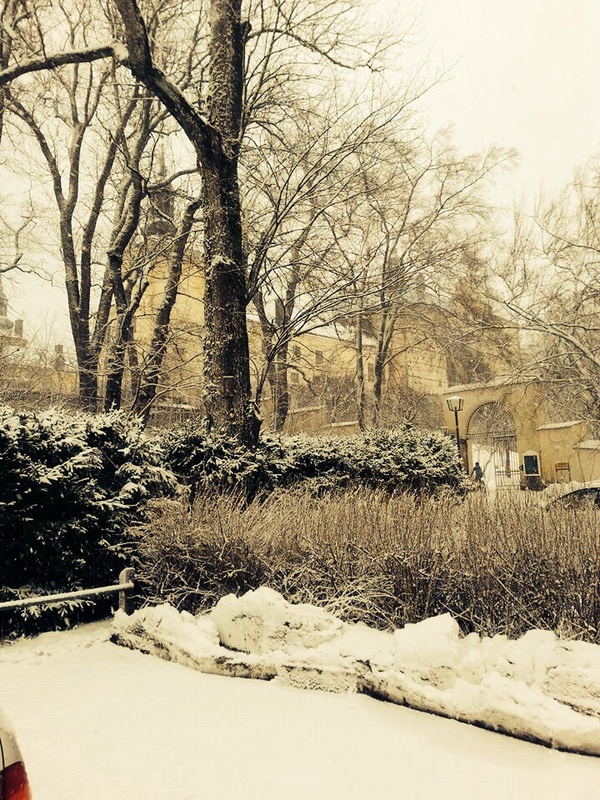 Winter decided to arrive with full force this day, so traffic was slow, but the park was breathtakingly beautiful. 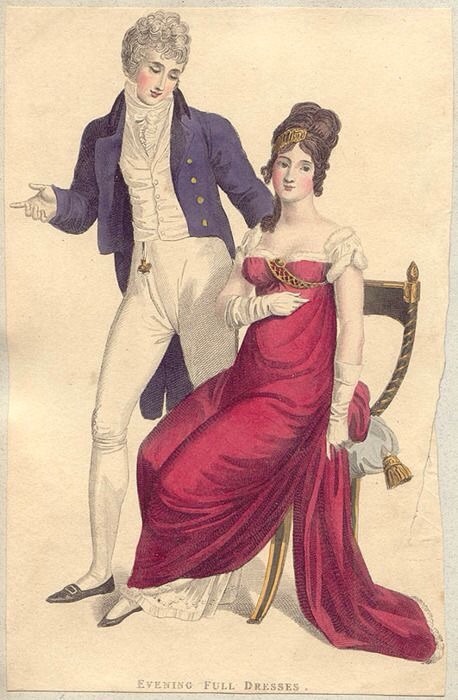 It was a challenge (I imagine) for the ladies in their sheer Regency frocks. The state rooms are closed to visitors off season. The wing is open though, and there is a restaurant, and above it a smaller (well, compared to the state rooms) drawing room that was kindly put at our disposal. The entire wing is used for wedding receptions and that type of events. 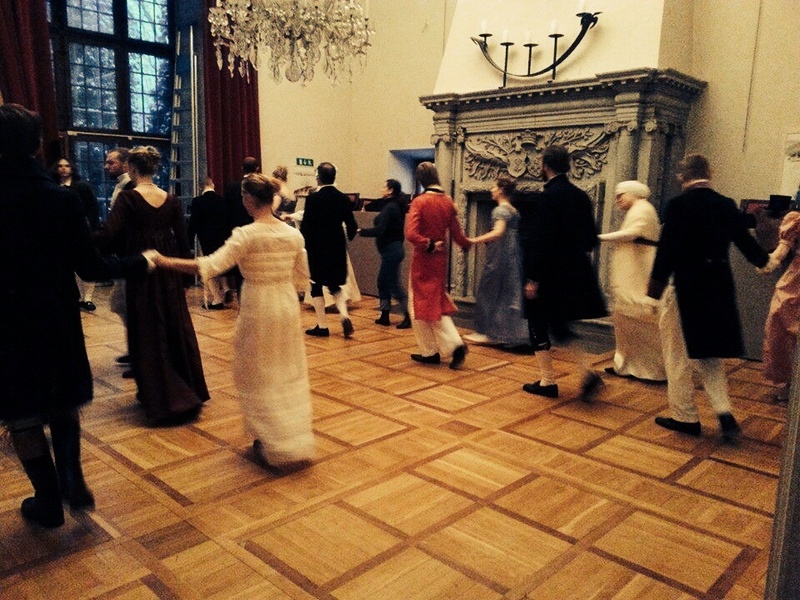 We were nearly twenty-five enthusiasts, all of us looking forward to some dancing. The grounds of Tyresö Castle covered in snow. Photo by Eva Hillgren. I wore my new top hat, boots, gloves and a warm scarf. Also première for new waistcoat. We danced many of the familiar dances. Here I think it is Upon a Summer´s day. Photo by Eva Hillgren. Impressive fireplace! The castle dates back to the 1630s, and was restored and brought back to a (improved) baroque-glory by its last private owner, Marquis Lagergren, around 1900. The Marquis was a character with international connections – he collected Marie-Antoinette memorabilia, had an American wife and was Chamberlain to the Pope. Dancing with newcomer Marie. I suppose we can call her a “debutante”. She did very well! Also the back of Sarah´s burgundy dress. Photo by Alexandra Ringblom. Selfie-session in the ante-chamber. 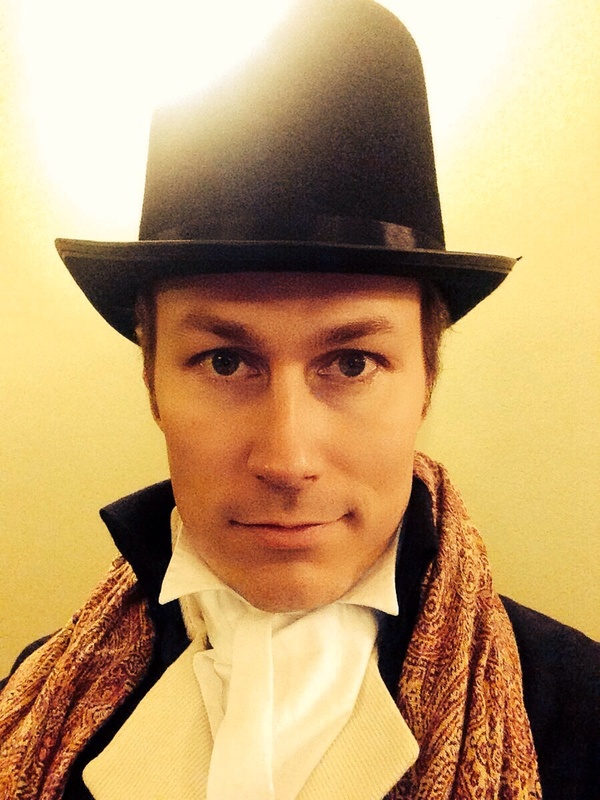 It was the first time I wore the waistcoat, a lucky find at the Royal Opera in August. Here is a glimpse of it. 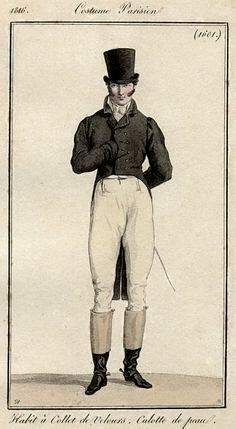 Breeches, boots and tailcoat. We had a wonderful afternoon with lots of dancing, food and laughter. 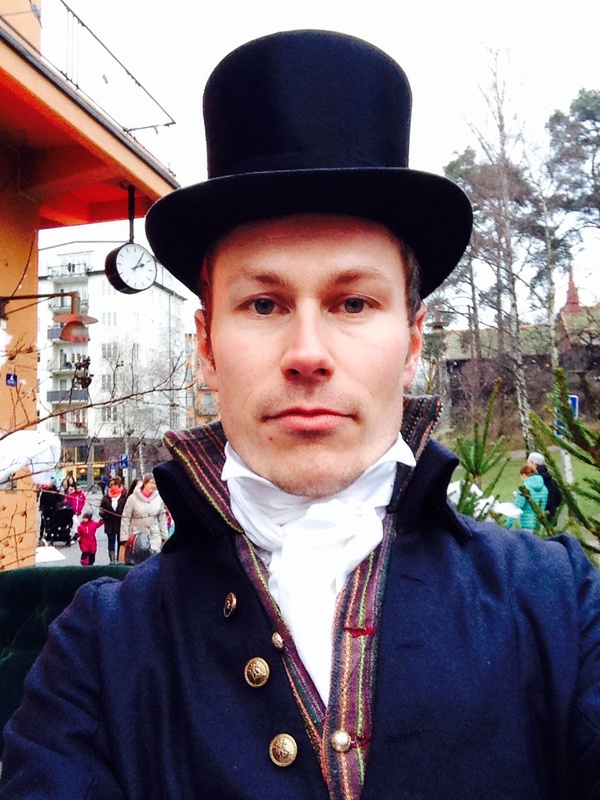 Warm regards to Anders for inviting us, and to our patient tutors Ylva and Jacob! 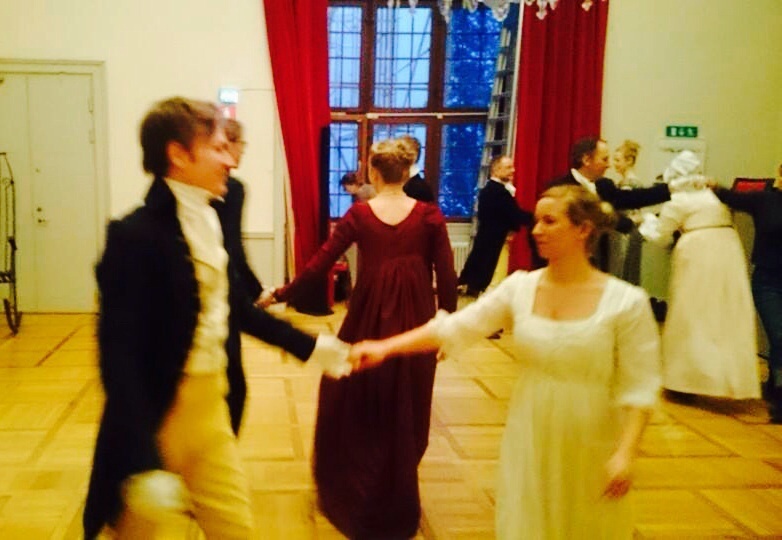 Do you have a favourite Regency dance? Do tell! This post ends with Grimstock, a funny clip from Pride and Prejudice, 1995. You have probably seen it countless times, but it is always very entertaining. Have a nice day! 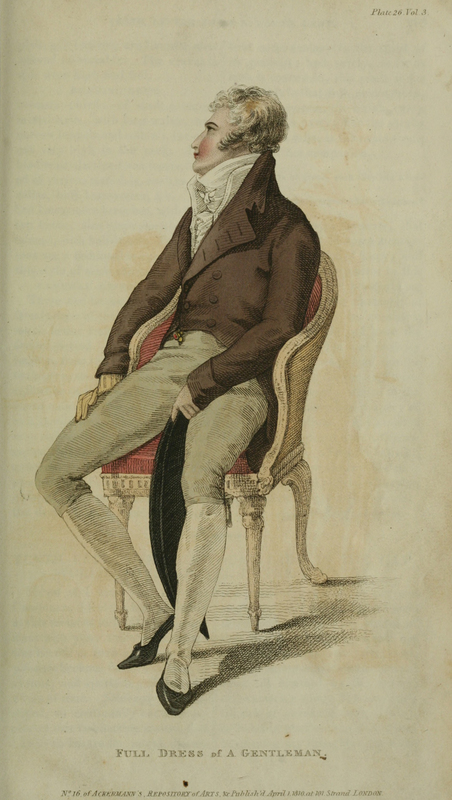 First, let us take a look at some portraits and fashion plates. 1795. Again, Monsieur Seriziat by J.L. David. A new era! 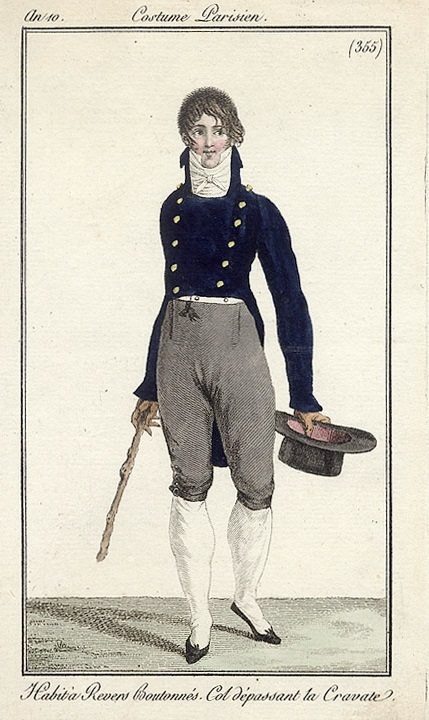 The tricorne was so l´ancien regime. For day wear, the “round-hat”, a striking felt hat with relatively high crown and brim down. 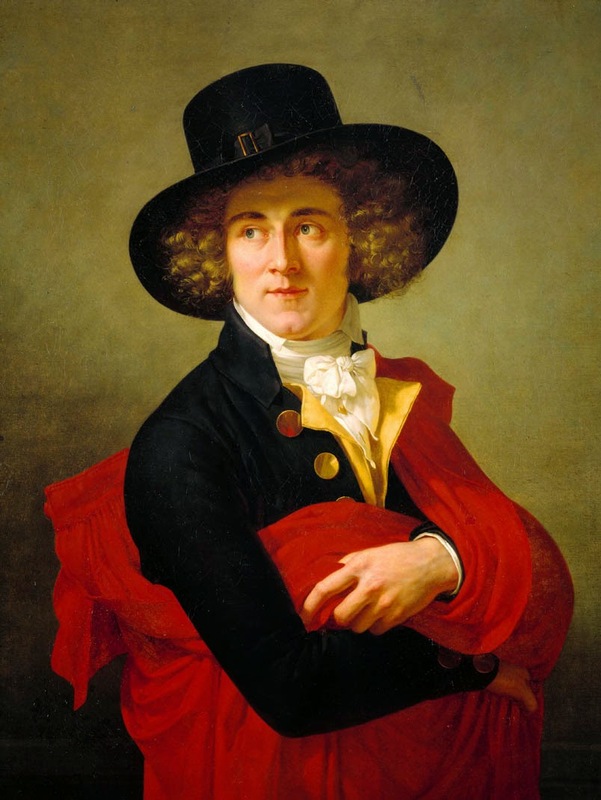 Here with a powdered wig, but it was soon gone, and the hat got smaller in proportions. 1795-1800. 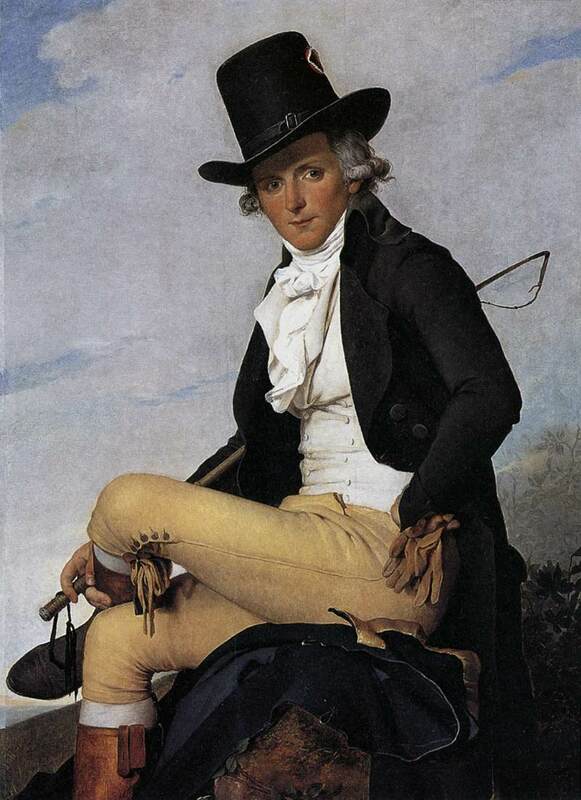 Portrait of a young man by Francois-Wavier Fabre. Still full curly hair and a round-hat with wide brim but somewhat lower crown. Note that the crown is flat at the top. The only decoration is a narrow ribbon and buckle. 1802. The same type of hat in a fashion plate. The fashionable young gentleman has cropped hair with curls framing his face. 1803. 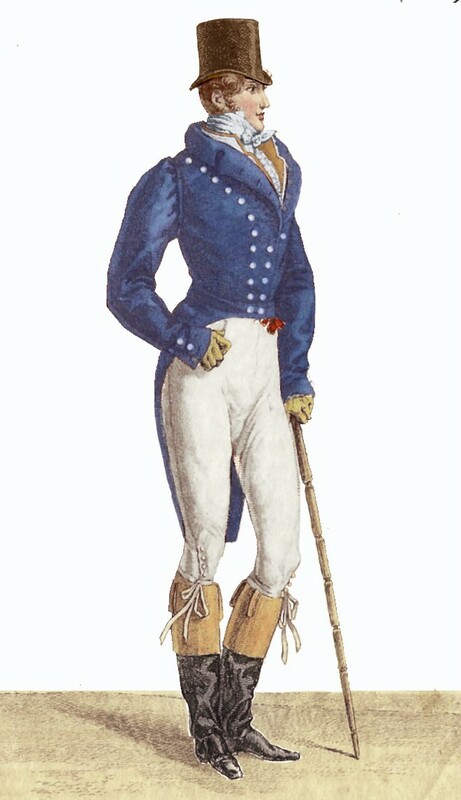 The bicorne, basically a wide brimmed hat with the front and the rear halves turned up, was still the correct hat for half- and full-dress (formal wear) and certain military and naval uniforms, and (my assumption) more popular with conservative gentlemen. 1804. The top hat. It seems the two hats above co-existed with this new type of hat that would – more or less – dominate for a century. Note that the crown is taller and widens at the top. The brim is now narrower and shaped to turn up slightly at the sides. 1804. 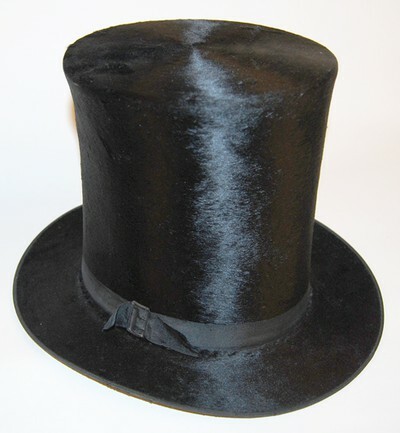 Another version from the same year, here with a “semi-bell” crown, the type of top hat you would see today. 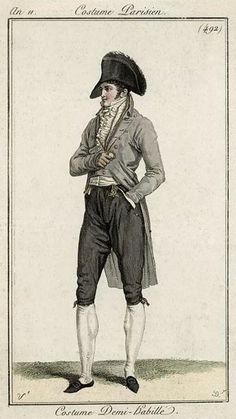 1807: A good example on variation in full-dress (evening) and half-dress (day wear) – buckled shoes, stockings and bicorne or boots and top hat. 1809. Even taller crown, again bell-shaped. 1809. The crown tapers in towards the top, known as the “Chimney” style. The brim is narrow. 1813. Now we are talking “stove-pipe” – the sides are completely straight and the crown is taller than 6 1/2″. They seem to grow in popularity well into the 1860s. 1817. Rather small looking, but nevertheless the “stove pipe” or top hat. 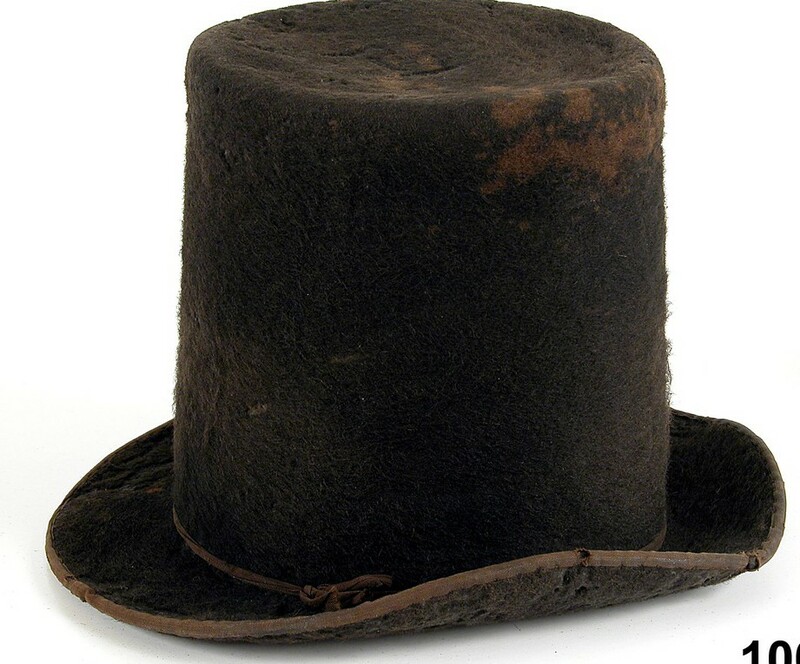 Extant hat, dated to around 1800. Very tall bell-shaped. I would date this a bit later. 1815-20? I was seen in this straw hat last summer. Protects from the sun. Ideal for picknicks or just hanging around the estate. 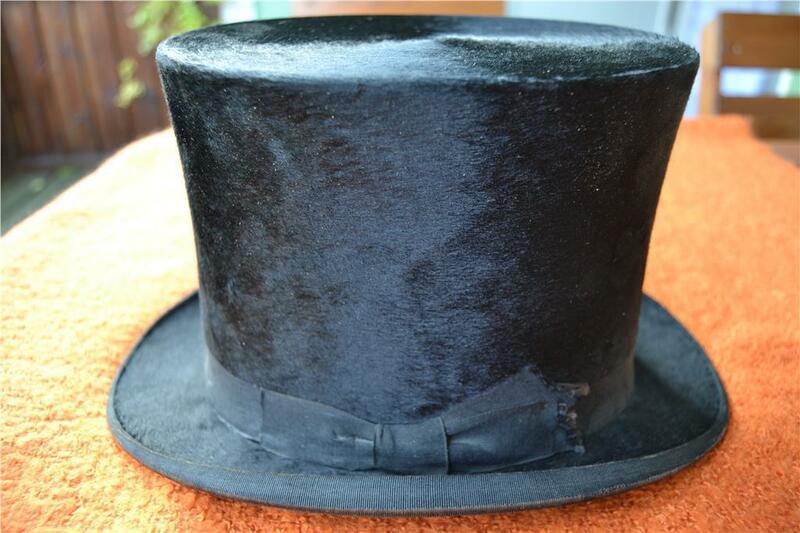 A classic top hat. Made in London around 1900 or thereabouts. This “Topper” is a bit too small, so I felt the need to look for a replacement. Photo not best quality, but neither is the hat. It is passable, though, and I can wear it on a rainy day without fear of ruining a family heirloom. Take a deep breath: Found it last week at a party store. 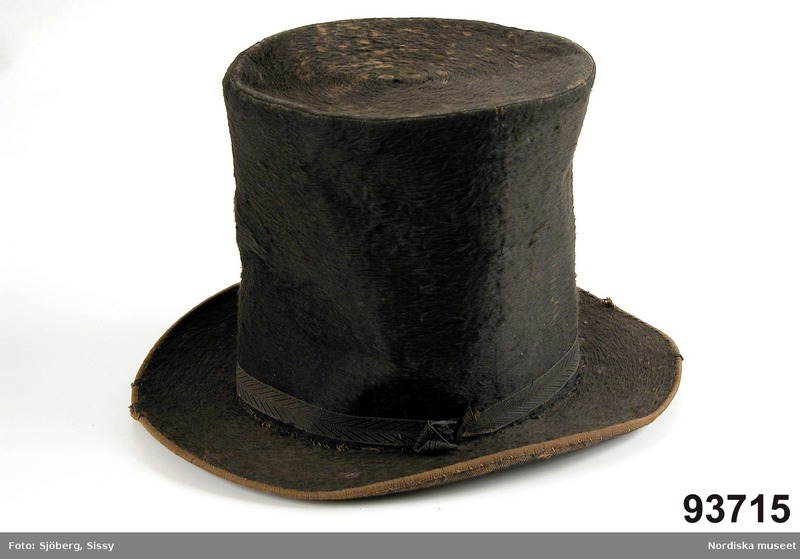 It is Smiffy´s “Tales of Old England Stovepipe Hat”. You must think I am a complete vulgarian. Pressed “felt” and awful plastic ribbon around crown and as binding, but the shape is perfect and ribbons can be replaced. I might even cover the entire thing with real wool or velvet. If I do, I´ll post about it. Give my word.